June has been an intense month of our team pulling together funding to purchase Sunridge and we have been blessed with more visionary benefactors coming to our table to put together a strategic plan for our successful acquisition. The Montrose Daily Press ran a featured story about the history of Sunridge that we wanted to share. Dennis Weaver, of television fame (Gunsmoke, McCloud, etc.) and his beloved wife, Gerry, have left Mother Earth, but their legacy lives on in the couple’s magnificent tribute to sustainability, their Sunridge Earthship. People have long marveled at the dedication this Hollywood legend made to Planet Earth. With the passing of first Dennis on Feb. 24, 2006, and Gerry this spring, their story lives on. Dennis Weaver wrote eloquently of their vision and legacy in his book, “All the World’s a Stage” (2001, Hampton Books). 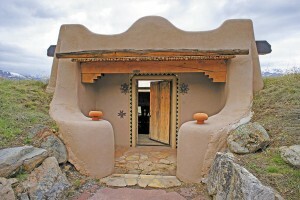 He wrote of his and Gerry’s dream home and property, Sunridge, and his Earthship in Ridgway, Colorado. In addition to being recognized world-wide for his contributions to acting and producing, Dennis Weaver also became known as a spokesperson and activist for fighting hunger in the world and his environmental concerns. 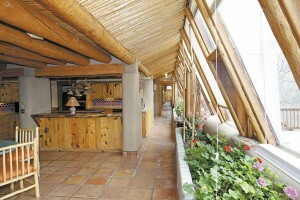 “My dad was a devoted environmentalist and with the house (Sunridge Earthship). He was attempting to shine a light on renewable resources,” said Rusty Weaver, himself a performer and environmentalist. Rusty Weaver noted the house was built out of blemished and recycled tires and cans. “Dad was attempting to enlighten people that there are other ways of building that don’t require cutting down a bunch of trees. Rusty Weaver explains that his father invented the word “Ecolonomics” and he founded the Institute of Ecolonomics, so that people realize they can make a buck by cleaning up the planet. “That’s what my dad was trying to teach. That you may have to give up something to take care of the planet, but it can also be profitable at the same time. 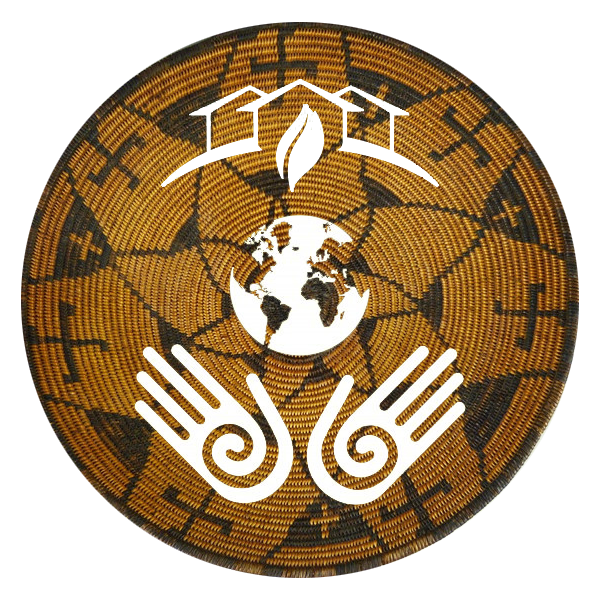 Rusty Weaver and his brothers, Rob and Rick, were instrumental in helping their parents with their vision of the Earthship. Together they made a documentary of the building of the home, which was used to promote their father’s word about living on the planet in harmony. In the summer of 2005, Dennis and Gerry Weaver sold their 2,500 square-foot beachfront home in Malibu. Then they began their quest to realize their dream of helping the planet. In his book “All the World’s a Stage,” Dennis Weaver writes of the “passion,” he had for 15 to 20 years and he says, “that passion still burns strong within me – to be part of the great wave of people that have become aware of the way we have trampled and abused this beautiful Earth and are determined to correct it. The warning, Weaver writes, was issued by more than 1,600 of the world’s renowned scientists from seventy different countries. It was not a fringe group at all, he notes, but prominent scientists. Weaver states in the book that mankind is headed toward an unparalleled catastrophe if things do not change. He and Gerry made up their mind to not only talk the talk, but to walk the walk, by living sustainably. Oh, they were mocked and belittled. Many can remember how they endured ridicule as they set about to build a “sustainable” home on this planet. And out of tires and cans! They finished that home 25 years ago on 20 acres in Ridgway, just up the road from Montrose. The “Earthship” has 3-foot-thick walls built out of compacted earth, recycled tires, and cans. Weaver describes their Earthship home in Colorado as becoming a “celebrity in its own right.” It has been the subject of many newspaper and magazine articles around the country. The home has attracted many film crews from a variety of TV shows and networks, from The Discovery Channel, The Today Show, Home and Garden TV and Lifestyles of the Rich and Famous. Weaver notes in the book (tongue in cheek) that “when you build a house out of cans and used automobile tires, it gets a lot of attention.” His son Rob Weaver produced the documentary film staring Weaver, Rusty Weaver and activist architect Michael Reynolds of Taos, N.M., documenting the building of the Earthship. It starts with the laying of the first tire, to the finished and decorated home. The documentary played on PBS for several years and at service clubs, churches and such. “Primarily it’s a solar/mass house.” Weaver notes people understand the solar concept and how to use it as an energy source, but it’s the mass concept of the house he feels is more interesting. Mass in a house tends to stabilize temperature, it holds energy. The Earthship operates on the same principal as being in a cave, Weaver explains, “where the air is cooler in the summer and warmer in the winter due to the surrounding mass,” but by using automobile tires (250,000 of which are thrown away a year in the US). In building the home, the dirt was rammed into the tires to produce density – the greater the density, the greater the mass; each tire bulged with the more than 3 wheel barrels of dirt rammed into them by sledgehammer. He called them “tire bricks” and when each was filled it weighed close to 400 pounds. Then the tire bricks were laid in courses, like regular bricks, to form the walls of the house inside and out. This surrounded every living space in the house with a huge amount of mass. The home needs no air-conditioning or heating ducts. Weaver said walking into the house feels like walking into nature, plants love it. It was one of his and Gerry’s goals, to grew organic vegetables year-round in south facing planters – tomatoes, peppers, lettuce, chard, cucumbers and spinach, and geraniums. The temperature in the house ranges, from it’s coldest at 58 degrees up to 78 degrees, no matter how cold or hot it is outside. Weaver said one just needed a sweatshirt in the morning and by the time the sun hit the house it warmed up comfortably. Ironically, Weaver notes in his book that he and his wife spent “a bunch of money” building a luxury house that county building officials classified as “experimental.” Weaver says in his book that the house used 3,000 tires and “several coats of adobe to give the house the beautiful Santa Fe look.” He gives credit for the house to his “project engineer” Don Haskell, who helped with every aspect of the building of the Earthship. In his book, Dennis Weaver says he and his wife Gerry felt the Earthship was the best house they ever lived in and they never tired of it. It was the last place either of them called home.